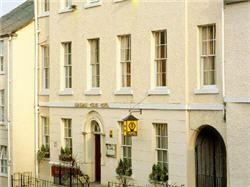 Lonsdale House is a quality town centre hotel located in a traditional lakes market town. All rooms are en suite with some four poster beds and jacuzzi. There is a feature garden with a high gothic wall and cosy restaurant serving locally produced food. Lake Windermere is just 20 minutes away and the hotel is a 15 minute drive away from the coast – the market square is a two minute walk away. Hotel Non-Smoking Throughout; Cots available; Wedding Licence; Car Parking Available On Site; Wi-Fi Available; Restaurant; TV; Satellite TV; Tea/Coffee making facilities in each room; Hairdryer in each room; Iron And Board In Each Room; Telephone In Each Room; Limited room service for hot food; Wake Up Call Available; Ground floor bedrooms; Wi-Fi Available In Public Areas; Wi-Fi Available In Rooms; Lounge Menu; Bar; Breakfast to go.